Sid Champion, Margie Bearss and Rebecca Drake greet the audience before reading the letters of Sid and Matilda Champion. Serving as color guards for the ceremony were Charles Tucker, Bert Green, Emmett Eaton and John Spicer representing the Tishomingo Avengers Reenacting Unit. 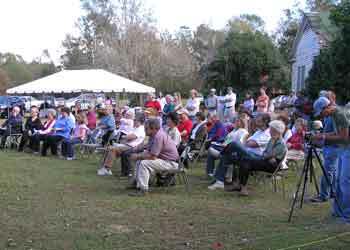 A crowd gathers on the grounds of the Champion house for the dedication of the book, My Dear Wife: Letters to Matilda, a collection of 104 Civil War letters written between Sid and Matilda Champion during the war. Margie and Becky pause to visit the Champion family cemetery where they placed a dozen red roses for Matilda Champion and a white mum for William Balfour Champion who died at the age of ten soon after the war. 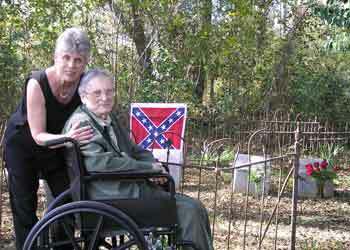 A Confederate flag was draped behind the grave of Sid Champion. 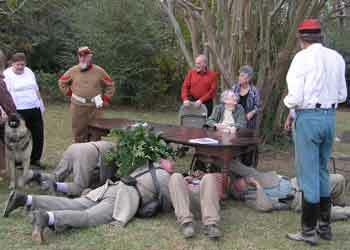 Members of Camp 1354 (John C. Pemberton) inspect Sid and Matilda’s dining room table that was used by Union surgeons as an amputation table. 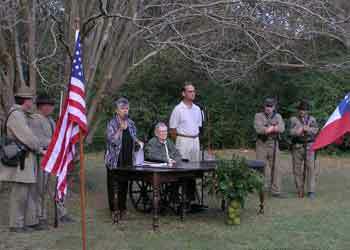 The table was saved by Matilda on her final return to the house before it was burned by Yankees in July of 1863. 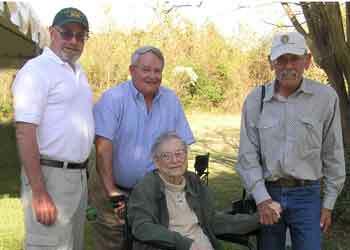 Congratulating Margie on the success of her new book are - left to right - Pete Brown from Texas, (History America TOURS), W. K. Vanderwal, friend from Arlington, Virginia, and John C. Waugh, author of Edwin Cole Bearss: History’s Pied Piper. 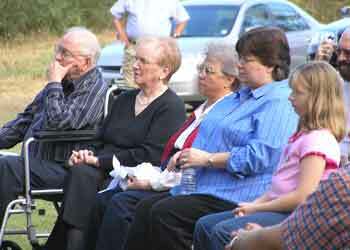 Members of the Champion family enjoy hearing the story of Sid and Matilda during the war. 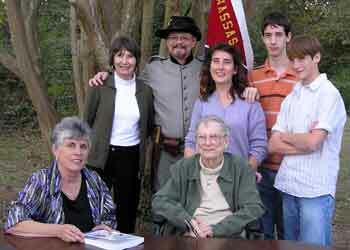 Pictured left to right are Billy Champion and his wife Annette Champion, Mary Champion, Janet Champion and Lauren N. Champion. 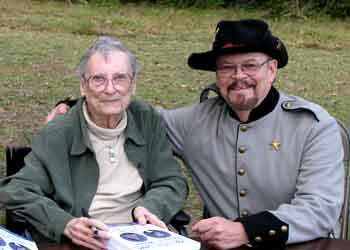 Margie signs a book for Billy Ellis, former student and long-time friend from Lexington, Mississippi. Margie Bearss with her daughter, Jenny Bearss, and grandsons, Todd and Andy. Also featured in the photograph are Billy and Kitty Ellis and Rebecca Drake. 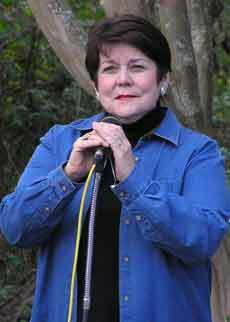 Lester Senter Wilson, mezzo soprano from Jackson delights the crowd with Dixie. 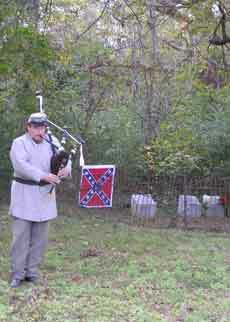 James Clark, bagpiper, plays Amazing Grace in memory of Sid and Matilda and their Scottish heritage. 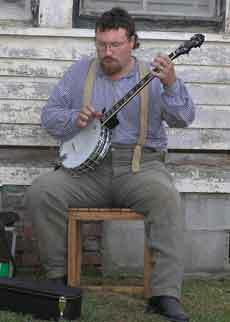 James Clark of Raymond picks the banjo as guests enjoy strolling the grounds of Champion Hill. 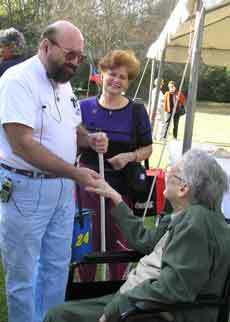 Don Fitzgerald, member of the Clinton Rifles SCV, and his wife, Pat, greet Margie Bearss. 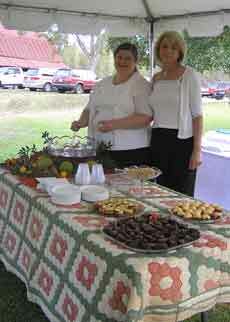 Lillie Lovett and Terry Brantley from Edwards delighted the guests by serving samples of Matilda Champion’s recipe for buttermilk pies. 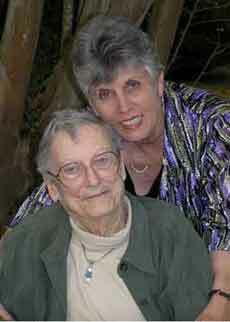 Margie R. Bearss and Rebecca B. Drake at the dedication of the new book, My Dear Wife: Letters to Matilda.